2H have been applying their R&D to the civil construction of Trickling Filters and have devised TWO new approaches to do just that. timber matrix. The key factors here are suitably resistant materials and a design that allows as much free air flow and wastewater drainage as possible. 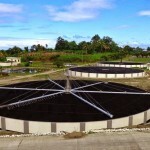 Trickling Filter media requires support off the tank base to allow the treated wastewater and sludge to drain away to the discharge gulley or outlet. The support system chosen can now help improve the overall efficiency of the process. PIERdek, has been designed to support Trickling Filter BIOdek media. 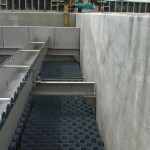 The support structure is installed on a flat but sloped concrete floor and carries the load from the fill media and the biofilm towards the floor without impacting the ventilation. The PIERdek design is tailored to hold the operational load, which depends on the media height, the thickness of the biofilm and the specific surface of the media. PIERdek is adjustable to any load by variation of the component spans. PIERdek has a far more open structure to maximise air flow and drainage and is constructed in plastic with stainless steel fixings. 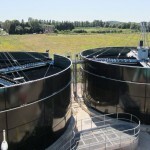 This makes it ideal for long term applications in more corrosive wastewaters. For example, in nitrifying filters where the alkalinity has been known to corrode dwarf wall support structures. 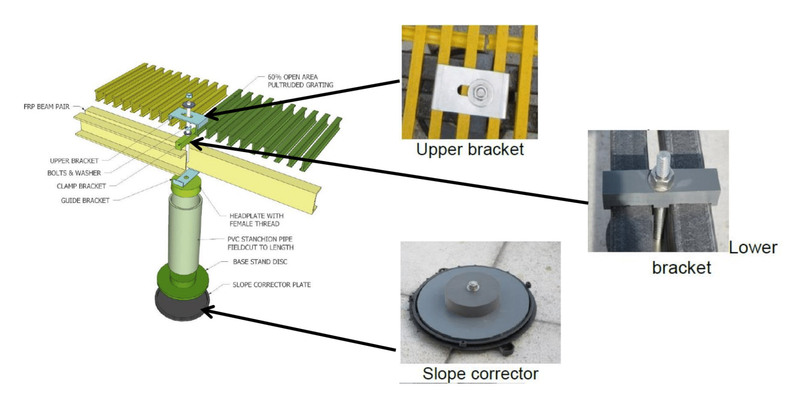 The support structure consists of vertical stanchions which are installed in a specific pattern calculated to match the operational load. The stanchions rest on slope adjustable (0% – 5%) base plates and hold a pair of FRP beams on the top. Perpendicular to the top is the actual support, made of pultruded grating. For media depths greater than 3m the support should be a minimum of 400mm high and provide a minimum supporting area beneath the media of 25%. This higher support allows room to incorporate air vents in the filter tank wall below the media. All components are fixed with a set of anchors and brackets. is due to modification of the panel spacings. The operational load is typically calculated with the German guideline DIN 19557, which gives a safe estimation for the biofilm thickness. Typically the volumetric design load ranges from 330 kg/m3 (for nitrification) up to 650 kg/m3 (for high loaded systems). 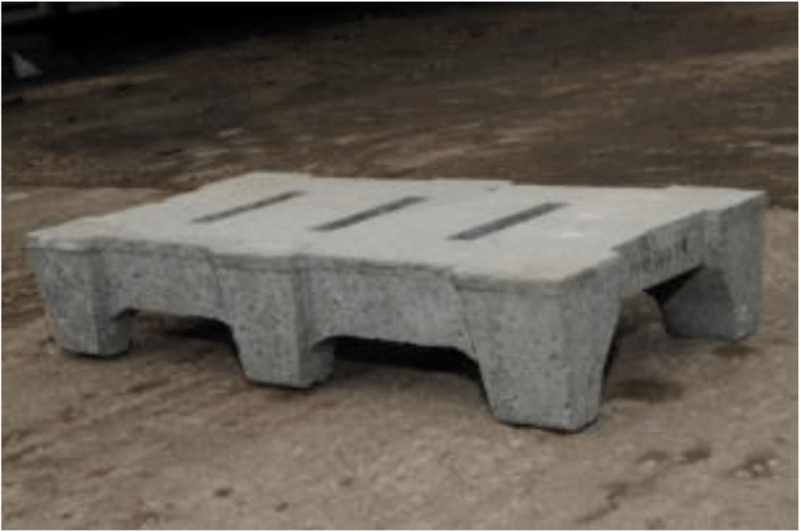 As an alternative to solid blocks 2H Water can supply and install high strength concrete tiles which are moulded to incorporate 6 supporting feet and 60% voidage. 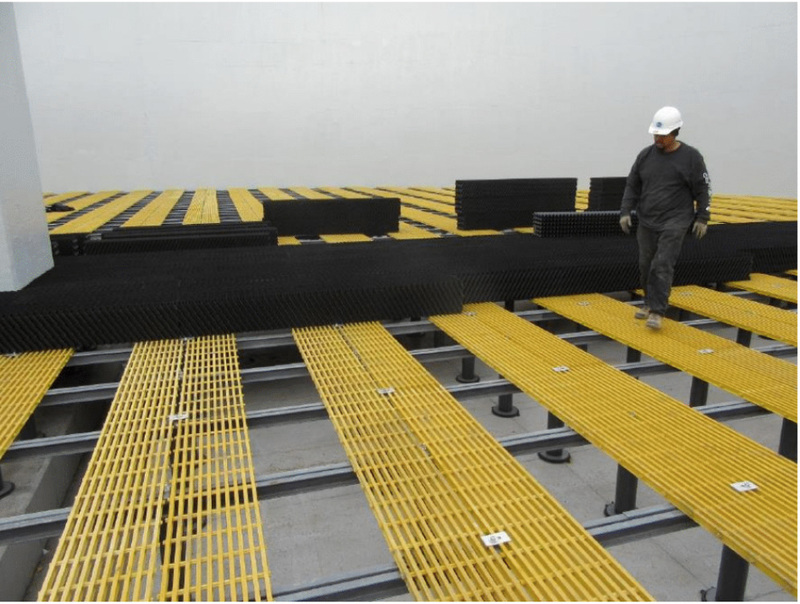 The big advantages of the 2H tile system is it provides far better drainage than solid blocks and greater resistance to corrosion. 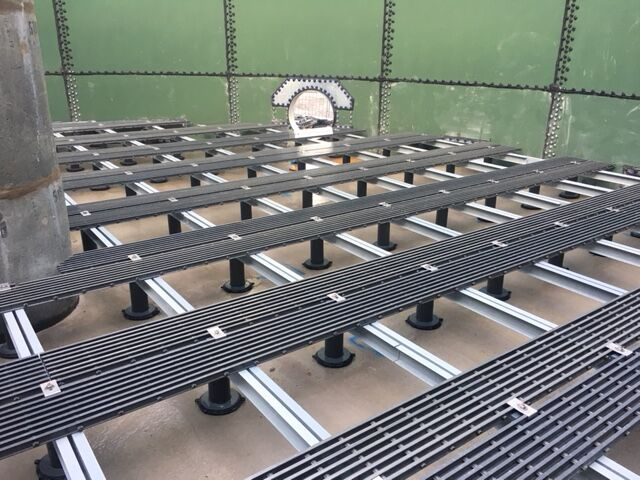 The tiles are used to support either mineral or plastic structured media 105mm above the tank floor to provide drainage of treated effluent under the media bed. The tiles are manufactured in high strength, long life concrete resistant to municipal wastewaters. 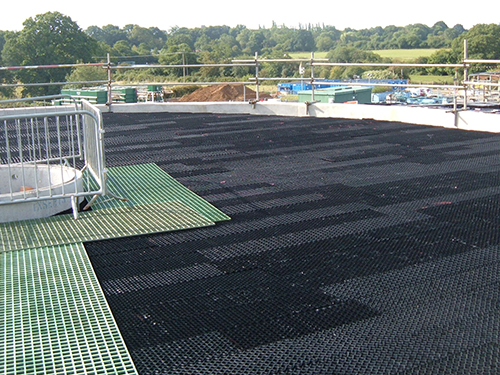 They measure 500mm long x 250mm wide x 105mm high and provide 60% voidage to enhance drainage. 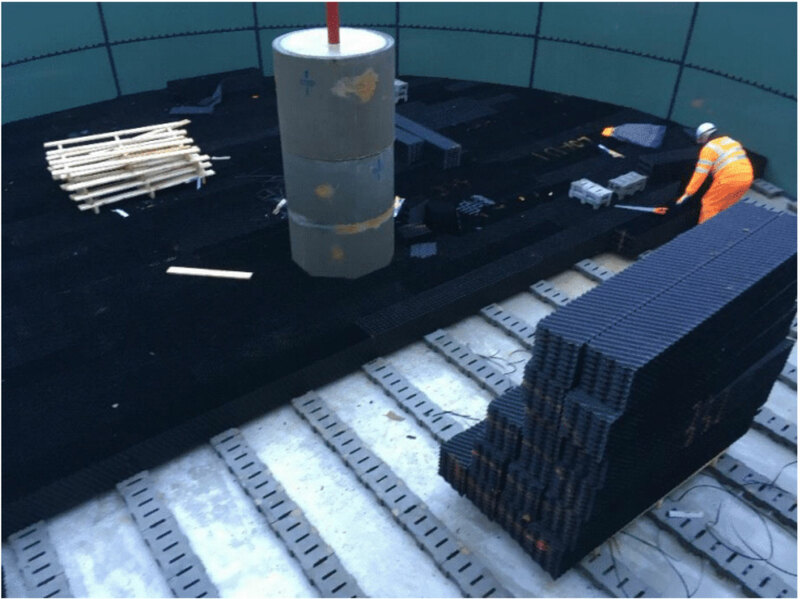 For mineral media applications, the tiles are laid across the entire tank floor. For plastic media applications, the tiles are laid in parallel lines on 800mm centres to provide the required 25% to 30% supporting area.